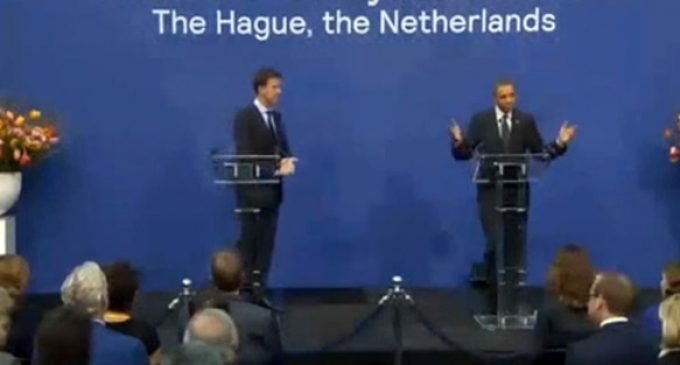 On Tuesday after speaking at a news conference in the Netherlands, President Barack Obama thanked the crowd -twice- and then waited awkwardly for applause that never came. One man took pity on the president and clapped, but that just made the situation worse. Obama seems to have become accustomed to fanfare and applause, but his joint news conference with Dutch Prime Minister Mark Rutte didn’t even trigger customary polite clapping. On the bright side, nobody booed or threw things. To All Federal Employees, If you are working in a job and your job description or the way it has been performed, has changed in the last 6 years to cause harm to the country known as United States Of America. Please stop doing the harm. IF you dont get it, the government is no longer controlled by people who love the USA. IF you work at the Southern Border, start turning everyone back. If you work in payroll,, you can change the tide with the way mistakes are made, hurt those who do not love our country. For those middle managers, turn a blind eye for those employees who are bucking the system, and not following the Orders of Obama and his Criminal Empire. For all Law Enforcement Officers across our nation, you do not have to take orders from the federal government, you local people are who you work for. As an ex Federal employee, this can be done, If you realize that it is just a paycheck, that not all jobs are worth destroying this country over, then your right. If all Federal Workers stop working, Walk off the Job until Obama and his Criminal Empire leave, Well it would take less then a month. Obama has no Power if he does not have the federal employees. Think about it people. We the People control this country, no Obama. Start thinking about our nation and your Fellow US Citizens. If Obama cannot do anything, then he will be forced out. Your can go back to your job after he is gone, and getting your pay check too. l can;t believe the AMERICAN people are so stupid,,,, what the h#$l good is a government that full of thieves, murders, and terrorists…they will do nothing but put you in chains and soup lines….WISE THE IF UP..